1. Place the vanilla pod, cinnamon sticks, grape juice and 200ml water in a large saucepan. 2. Add the pears and bring to the boil. Turn down the heat to a simmer, cover with a lid and poach the pears for 20-30 minutes, turning once in a while. 3. The pears are ready when a cocktail stick can easily be inserted into the flesh and they are tender all the way through. Remove from the heat and leave to cool in the pan. 4. 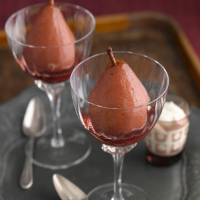 Serve the pears warm or chilled with the juice and a small spoonful of the crème fraîche.